WIGGINS, Charles Edward, a Representative from California; born in El Monte, Los Angeles County, Calif., December 3, 1927; attended the public schools in El Monte, Calif.; B.S., University of Southern California, Los Angeles, Calif., 1953; LL.B., University of Southern California, Los Angeles. Calif., 1956; United States Army,1945-1948 and 1950-1952; lawyer, private practice; member, El Monte Planning Commission, El Monte, Calif., 1954-1960; councilman, El Monte, Calif., 1960-1964; mayor of El Monte, Calif., 1964-1966; elected as a Republican to the Ninetieth and to the five succeeding Congresses (January 3, 1967-January 3, 1979); was not a candidate for reelection to the Ninety-sixth Congress in 1978; judge, United States Court of Appeals, Ninth Circuit, October 11, 1984-March 2, 2000; died on March 2, 2000, in Las Vegas, Nev.; interment in Arlington National Cemetery, Arlington Va.
Ralph Nader Congress Project. 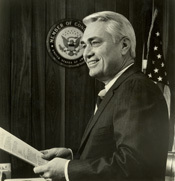 Citizens Look at Congress: Charles E. Wiggins, Republican Representative from California. Washington, D. C.: Grossman Publishers, 1972.